Together with André and Martin Gaedke I just published an article for the german computer journal Objektspektrum. 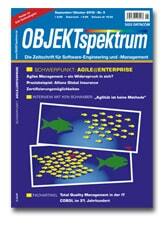 The name of the article is: “Agile Praktiken – oder doch Impediments? Bewertung der Agilität von Praktiken in der Softwareentwicklung”. In the article we discuss some common practices in the software industry and how they support or don’t support agile software development methodologies. You can order the issue of object spectrum here or just buy the article as a pdf version here.